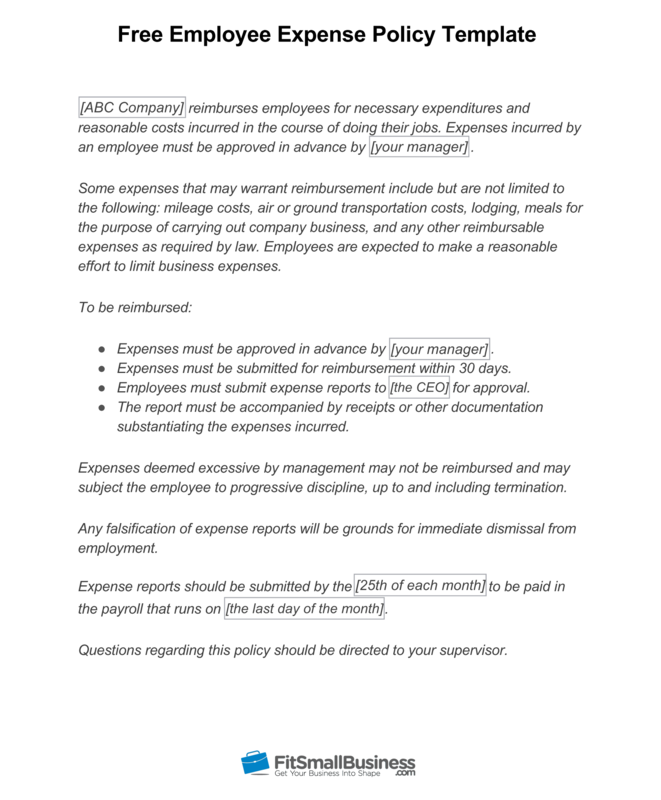 Employee expense report forms make it easy for employees to be reimbursed for business-related expenses they incur, and an employee expense policy gives you control over what expenses are permitted. The report is used by the employee to detail expenses and the policy details what is eligible for reimbursement, how it is reimbursed and when. An easy way to manage employee spending and track expenses is with a prepaid business credit card like those offered by Bento for business. You can add funds to each card and control where, when, and how each employee uses their card. And, Bento integrates directly with major accounting software (like QuickBooks Online), making expense tracking for each card easy. Take Bento for a free 60-day test run with two free cards and setup fees waived. We recommend that you use this form in Excel or Google Sheets for easy calculations. Here are the four steps to create an expense report and policy. While our expense policy template is fairly basic, if you have a young workforce or if your employees travel or entertain clients frequently, you might want to be more specific about what are approved expenses. You could also establish a per diem or daily limit on employee spending, usually $50 to $150 per day for meals and lodging for an employee who is traveling. All companies should account for mileage and other IRS-approved expenses. Some companies provide ranges of what’s acceptable for expenses, such as meals while traveling. Most businesses limit the kinds of approved expenses to what the IRS will allow, such as reimbursable meals during a sales call or a car rental while on a business trip. Here’s information from the IRS on deductible travel expenses. However, others include nontravel expenses that might be used by a manager for an employee perk, such as reimbursing a supervisor for hosting a pizza party or paying your admin back for buying office donuts to welcome new hires. Some companies also choose to convey examples of what are not approved expenses. This most commonly includes alcohol, but it can also include things like the class of service. For example, you may want to reimburse traveling staff for coach or business class airfare, but not first-class airfare. Many companies feel that if an employee wants a glass of wine with dinner, that should be on them while others simply set a daily limit or limit per meal without placing restrictions on the type of expense. Some businesses require all expenses to be pre-approved. However, what’s more common is to provide employees with guidelines on what kind of expenses need pre-approval. For example, your sales team may not need your OK to buy gas for a sales trip in the company vehicle. But, you may want them to obtain your approval before they book an out-of-town flight for a customer meeting. Think about and then document the kinds of expenses and/or the dollar amount that you will require your employees to get approval on before spending money and submitting the expense. You can even build notes into your expense report to remind employees of the limits or preprogram reimbursement amounts like mileage. How Do Employees Get Their Expenses Approved? Do your employees need to ask prior to purchasing something or do you trust them to make the decision on their own? Should there be a limit, such as any expense of $50 or more, that needs approval? This can be a good policy if you have team members buying equipment like painting and home repair equipment, which can rack up quite a large bill. Who Do They Submit Expense Reports To? Do they report expenses to you, their supervisor, human resources (HR) or your payroll provider? Who will collect expense reports? How often? We recommended having one point of contact for tracking reimbursable employee expenses to reduce any chaos. That person can also ensure that the expenses are allocated properly to the correct cost center in your accounting system. What Do They Need to Provide to Get Reimbursed? Aside from filling out an expense report form, what else do they need to have? Original receipts? Pictures of receipts? Dates, times and client name/reason for expenses? This is usually the section of your expense reporting policy that needs to be as clear as possible in order to prevent issues. 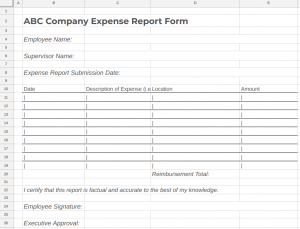 Based on whichever expense reporting template you use, you may want to add columns to track client name and reason. 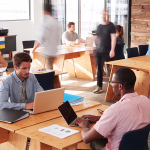 In fact, some companies go so far as require each employee to assign each expense to a cost center to make it easier for the accounting team to do data entry. What is the Time Frame for Reimbursement? How often do you want to reimburse employees? What day of the month or date should they submit expense reports by and do the expenses ever expire? 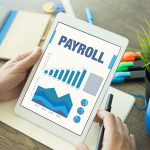 Every month or every quarter are the most common practices for reimbursement, with a timeline of submitting expenses to be at least five to 10 days in advance of the next payroll cycle. If expenses are reported late, they can be reimbursed the following pay period. You may also want expenses turned on by key quarter and year-end dates in order to keep your accounting system accurate. Here is an expense reimbursement policy that you can modify to suit your small business. You may also access this template here as a Word Document and here as a PDF. 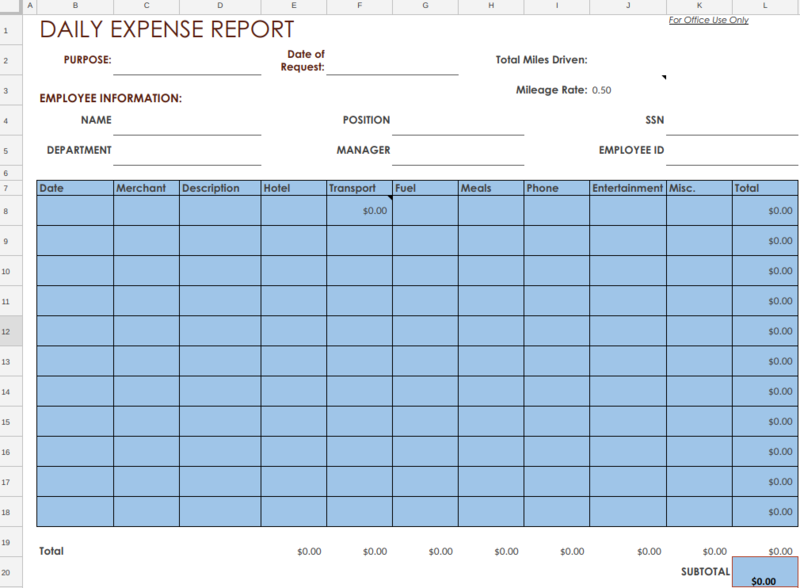 The most common practice to document employee expenses is to use an expense report form, like our template above. We also provide additional forms in our article free expense reporting templates. Alternatively, you can use HR software that has expense reporting options built in, such as Zoho People, or apps designed for expense report management like Divvy. This software can help you to organize your expense reports in a more logical way since all of the records are kept electronically and organized by employee name as well as have automated approval features. Whichever method you use, you should track employees’ expense amounts and make sure that they are appropriate. Sometimes, you may find employees expensing items that it may be better for you to bulk purchase like supplies and equipment. We recommend keeping your expense form template in your company’s shared drive; or leave copies in a designated folder that everyone has access to, for easy use. We recommend that you have your accountant or an HR professional review your expense reporting policy before you distribute it to employees. Then, once you have finalized your policy and the accompanying form, ensure all employees get a copy of the policy and understand it, for example, have a company-wide meeting or video conference call. If you’d like to be more thorough, have each employee sign and date a copy of the expense policy, and document this in their personnel files — electronic or paper is fine. If you have an employee handbook, the expense policy should also be added in there. Money questions are often confusing; this is especially true if you are the one holding the purse strings and it’s your employees who are spending the money. Here are common expense report questions employers have and how to solve them. How Can I Prevent Employees From Falsifying Expense Reports? You never want to think someone on your team would steal or harm your business, but if your gut tells you that you someone in sales might be expensing a bit too much, it may be worth looking into. First, you need to review all expense reports. Look at the evidence as a whole. Consider the employee’s expense report trends over their entire time at the company. If possible, have an outsider look at the pattern as well like your accountant, an attorney or an HR professional. What do they see? If you find overstated or inappropriate expenses, you may need to address it with the employee. How Do I Confront an Employee Who Turns in a Bogus Expense Report? If you have proof that the employee is stealing or falsifying reports, you need to tread carefully. You will want airtight documentation on what is happening. Then, you need to decide what you want to do. Is this a fireable offense? How bad is it? Should the employee just pay you back? What do you want to come out of this? Once you know what you want to happen, you will want to confront the employee with another party present as a witness. Explain to the employee what you have found, and present copies of the records you think are false, so keep the originals in your files. If you want to, you can hear the employee’s side and provide coaching and/or discipline. Alternatively, you could terminate the employee in the same conversation. You can learn more about what you would need for termination here. How Can I Get My Employees to Turn Their Expense Reports in on Time? This is probably the most common problem when you have an expense report policy. The sales team is always late but wants to be reimbursed. The marketing team forgets to include receipts, and accounting, HR or you then go crazy trying to figure it all out. We recommend you document and stick to your policy. This is important to ensure the employee is reimbursed properly, and you aren’t rushed. Make sure you outline your expense policy clearly and reaffirm that if people do not submit their expenses in the proper format and timeframe, they will not be reimbursed or will have to wait until the next pay period. Perhaps advise them to set a calendar reminder two days ahead of the deadline to complete their expense reports and to leave an hour to complete them. Another workaround is to use Bento’s prepaid credit cards. Your employees’ expense reports for their prepaid card are tracked automatically, and that information can be integrated into your accounting software, either directly, such as with QuickBooks Online, or via a CSV file. Try Bento free for 60 days, and get your setup fees waived and your first two cards free. How Do I Get Existing Managers to Adapt to Our New Expense Report Policy? If your expense policy is a new addition, you might need to deal with people who feel they are above the policy or can do things the way they always have. This is a common problem when you have employees who have been with your company for a long time, or when you are implementing a more formalized expense reporting policy than you have in the past. Similar to forms not being turned in on time, you will want to stick to your new policy, including forms and timeframes. Leaders should lead by example, and this is simple expenses and reimbursements. If a manager or leader has a big problem with a new policy, a little red flag should start to wave in your head that this person might not be a good long-term fit for your business. Can I Use Petty Cash Rather Than Manage an Expense Reporting Process? Some businesses make things easy on employees by using a petty cash fund for minor expenses like those that are $50 or less. For example, if your receptionist needs to buy posting to mail a client package, he or she can turn the receipt into petty cash and get reimbursed without going through a formal expense reporting process. However, it’s best if the petty cash fund, similar to an expense report, requires some form of documentation like a signature, amount and purpose of the expense. Can I Simplify Employee Expenses by Having Them Use My Company Credit Card? Some employers simply give employees their business credit card to use for purchases. This saves the employees the trouble of spending their own money and having to request reimbursement. Using your business credit card may be an option if purchases are infrequent, or you have a small workforce. However, as your employee base grows, you’ll need better controls on your employee spending and won’t want to have to track down credit card charges to find out who made them and what they were made for. An employee report expense policy and employee expense report form are easy to create and implement. You can use our templates above. These will give you insight into your employees’ spending and will provide you with valuable records so that you can learn, for example, if one client might cost more than they are worth. It can give you more information about your business than you might think. If you want an easy way to both control employee spending and track expenses easily, check out Bento for Business. Its prepaid credit cards allow you to control where, when and how much each employee spends. Plus, you can generate reports for each employee’s card in seconds and send those reports right into your accounting software, simplifying the whole bookkeeping process. Try Bento out free for 60 days, and get your setup fees waived and first two cards free. This template will give you insight into your employees’ spending and will provide you with valuable records so that you can learn, for example, if one client might cost more than they are worth. It can give you more information about your business than you might think.